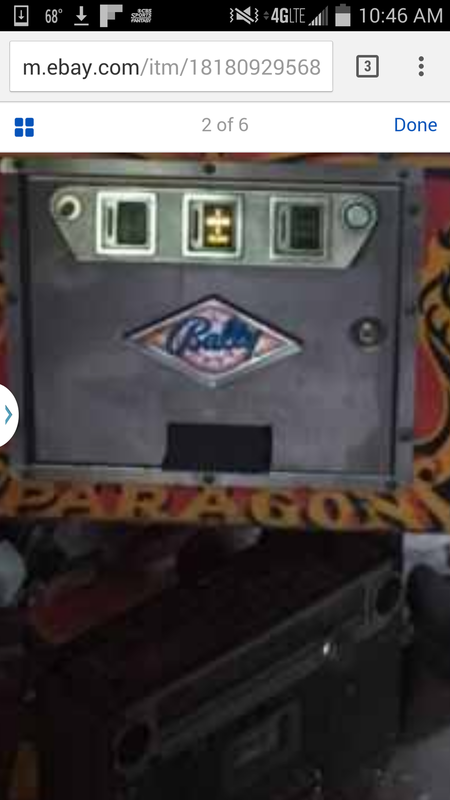 » Forum » All Pinball » Anyone know who's paragon is on eBay in Canfield? » Anyone know who's paragon is on eBay in Canfield? Anyone know who's paragon is on eBay in Canfield? There's a paragon on ebay and it's close to me. I was wondering if anyone knew who's it is, what's the condition and what their really looking to get out of it. I dont know who the seller is, but I am always happy to open my mouth and share my opinion. Either way, I hope that you can find a nice one that is fairly priced and close by. I see some paint flaking at the very bottom right in the middle, and I can tell that someone has touched up the black around the bonus inserts. The coin door coin return appears to have been cut out into a big rectangle. The room where the machine is located appears to be a total mess, and for me that is always a red flag on the type of owner. I suggest making a conservative offer and getting the sellers phone number and then planning to drive 90 minutes over there. The room where the machine is located appears to be a total mess, and for me that is always a red flag on the type of owner. $750 If you don't really care if it comes or goes but might like to have it. $900 is legitimate if you are really pursuing it. All offers based on condition of course. The coin door coin return appears to have been cut out into a big rectangle. I think that is a piece of tape covering the coin return. I'm really trying to hunt one down, I have no idea how long it would stay. But I think the layout is pretty unique and want a restore project for the winter. Judging from where it's being stored, I'd guess the temperature fluctuates wildly. The backglass is probably worse than it looks in the photos. I already see a chunk missing along the bottom. The there's a good chance that the playfield is planked too. The player 1 display has burnt segments. The player 2 display has an extra segment lit when it's not supposed to be. There's a good chance that the MPU has battery damage since I doubt it's been serviced at all. To me, it looks like it's just a piece of gaffer's tape, not an actual hole. I'd consider it a project, and probably wouldn't go over $500 for it just based on the photos. I live here and have no idea who this is. Under $1000 for sure I'd say. And I thought you knew everyone! Or maybe Chicago "If you leave me now"
If it helps ya get a idea as to what to pay ...... I just paid 1150 for a Paragon that has very minimal pf wear in the center of the pf, bg is almost flawless. has a new MPU, solid cabinet and 100% working condition. No hacks or anything else to speak of. So at 1700 .... that is steep in my opinion. Especially since you can't see the back of the bg, the boards (acid damage etc.) or a clear photo to see if there is any touch-up on the pf! I was able to pick mine up (in OH of course) so I had no shipping or any other cost! Paragon goes for high dollars these days and they don't last. 1700 seems steep but I wouldn't think 1200 was unreasonable. That is if it's not as bad as it looks which is not usually the case! Really? No love for sir-mix-a-lot? You guys are way more 8 track than cassette. Try sending up a flare or maybe using tom-toms?